So I’ve seen this billboard for the past several months mentioning that the world will end on May 21st 2011. If you search the internet you’ll find plenty of sites talking about the end of the word, such as this one from Business Insider. For me I’ve been so so busy at work that the idea of the end of the world sounds like a really good and well needed vacation from life. I mean if things don’t suddenly stop I have to face the horror of more tension filled meetings and deadlines in the coming week. To be fair I think I’ve been getting a bit of the hang of my current job working as a Black Belt Project Manager, but I could sure use a break and the end of the world is certainly a break. But honestly I didn’t hold my breath keeping my hopes up for this to come. And probably like many of the rest you, you find this another thing to chuckle and make jokes about. So did I until I stepped outside and enjoyed the fantastic weather today! One the morning of the day this World is supposed to end, I started on a typical walk with my dog and was struck even stunned by the fantastic weather. The sky was absolutely clear of all, clouds, and quite blue. The Sun was absolutely intense and brilliant and this red flag in front of my apartment was not just red, but now shimmering brilliant red with the crisp sunlight reflecting the threads of its fabric. I never knew the threads in this large red flag had a smooth enough finish to actually shimmer like that! The air, the breeze was crisp. It was stunningly beautiful. Maybe even surrealistically beautiful. And then I went back upstairs and stepped out on our balcony to meditate and soak in the beautiful morning. I sat down and my dog followed me. I sat down in lotus position and just marvelled at the natural sounds of life in contrast to the abstract intellectual world of web conferences, emails, spreadsheets and reports that make up my work week. 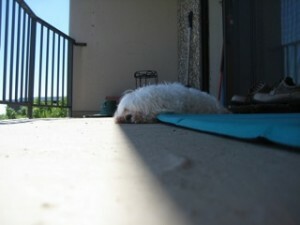 I thought to myself, “Man today is just so so SO beautiful!” My dog just sat beside me and meditated with me. She was enjoying the Sun too. 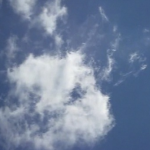 Maybe after an hour just sitting in this Sun, I started noticing some whisps of clouds starting to form above my head. And so I broke out of lotus position and started lying down with my head staring straight up at the sky. I watched this whisp of clouds rapidly molt, transform, move, appear, evaporate and reappear. If you were someone else watching me you might have thought I was “spacing out”, but I’d say I was more just having my head in the clouds in the truest sense. It’s been maybe more than 20 years since I’ve ever lied down and just gazed at the clouds, marvelled at their shapes and just wasted hours of the day away, like there was nothing really to do. And so I though: “End of the Day, Haaa, Really!” I mean this is about the exact opposite of the End of the World. Nothing menacing at all. Everything absolutely glorious, relaxed, calm. All was truly well, even better than well! A bit more like Heaven. Then I thought: “Wait a minute …. a bit like Heaven? Hmmm. Heaven? Hmmm”. In a world that has seem so turmoiled to pop into a reality where this picture of my dog summarizes the day. Notice how menacing the day looks, NOT. Notice how stressed and agitated my dog appears, NOT. It’s more like Heaven. What if this is Heaven? Then maybe the World actually has actually already ended? Like maybe just after you blinked your eyes to fall asleep a cataclysmic event occurred far beyond our wildest imagination. Our part of the Universe blew up in an instant and so fast we couldn’t even see destruction coming. Like some kind of Hyper Super Nova blew up humungously faster than the speed of light and in the blink of the eye we were vaporized faster than the pulses in our head can travel in an inch and so death and destruction was shockingly painless and unnoticeable. And so after death we are all waking up. Well actually I can’t speak for all of us, but at least for my perspective and all the people I could see from my balcony. So you might be thinking, this sounds all far fetched and I’m off my rocker, but bear me out. Could you not entertain the possibility of an instantaneous destruction? And if so then if this did occur and occur so fast, we’d all have skipped the scary and miserable part of seeing our imminent death and destruction and jump straight to a heavenly existence. And so I really couldn’t complain about today. I’d wish every day were like today. It was in the grand overview of my life, like being in Heaven. And let me walk you a bit further down the “rabbit hole” What if every moment we are instantly destroyed and the next instant we pop into a new existence. What if the end of the world is every moment!? So like in all moments just prior to the end of the world, you think of treasuring every precious second prior to your inevitable death and destruction. But then you are reborn the next instant only to face the next end of the world. And so every moment is very precious. To be sipped like whatever it is you’d associate with Heaven. And so in a round about way the message of the end of the world is just one more step towards a message of simply being so grateful of the now, of simply taking the time to be in the present. So you’ll be seeing more signs about another day as the actual End of The World. So instead of criticizing them for making so many predictions that never come true. Why not criticize them for not declaring enough the predictions that have so secretly come true. They should be coming out with signs that the End of the World will come the next second, and the next second, and the next, and the next ….